This set of topics describes how to use the COPY command to unload data from a table into an internal (i.e. Snowflake) stage. You can then download the unloaded data files to your local file system. Use the COPY INTO <location> command to copy the data from the Snowflake database table into one or more files in a Snowflake stage. In you the command, you specify the stage (named stage or table/user stage) where the files are written. Regardless of the stage you use, this step requires a running, current virtual warehouse for the session. The warehouse provides the compute resources to write rows from the table. Use the GET command to download the data files to your local file system. The instructions in this set of topics assume you have read Preparing to Unload Data and have created a named file format, if desired. Before you begin, you may also want to read Data Unloading Considerations for best practices, tips, and other guidance. 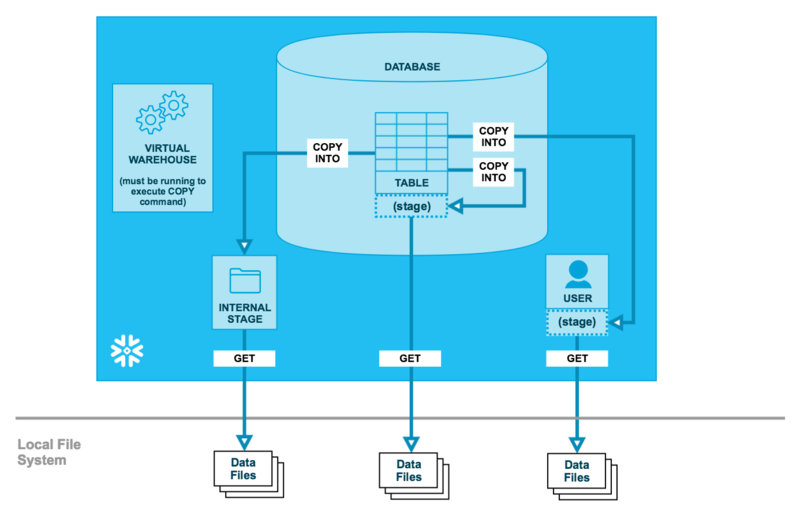 This section provides instructions for unloading table data to a named internal stage, table stage, or user stage. Internal stages are named database objects that provide the greatest degree of flexibility for data unloading. Because they are database objects, privileges for named stages can be granted to any role. Note that the @ character by itself identifies a named stage. Because the file format options were defined for the stage, it isn’t necessary to specify the same file format options in the COPY command. Note that the @% character combination identifies a table stage. Note that the @~ character combination identifies a user stage. Staged files can be deleted from a Snowflake stage using the REMOVE command to remove the files in the stage after you are finished with them. Removing files improves performance when loading data, because it reduces the number of files that the COPY INTO <table> command must scan to verify whether existing files in a stage were loaded already.